AD Morgan lied about his age to join the Confederate Army during the American Civil War. He served under General John Hunt Morgan and his raiders (No known relationship between A.D. Morgan & JMH, yet). AD took care of JHM's horse and personal effects. AD remembered a silver cup that he had to take care of. He was captured during the great raid through Ohio and finished the war in a prison near Chicago. He always refered to all people from the north as "Damn Yankees". Apparently a result of hard feelings from the Civil War. Also AD's father, Elsey Morgan, was killed by a northern soldier during the war. The Union soldier had mistaken Elsey Morgan for General John Hunt Morgan, the notorious Confederate raider, and shot him in the back on the street in his home town. The soldier was later tried and convicted for murder. This photo was taken in the 1920's. Alphonso DeLeon Morgan was always simply refered to as AD, his first two initials. 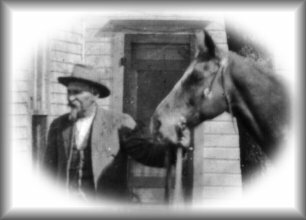 AD had a favorite horse by the name of Brigham (pictured with AD). 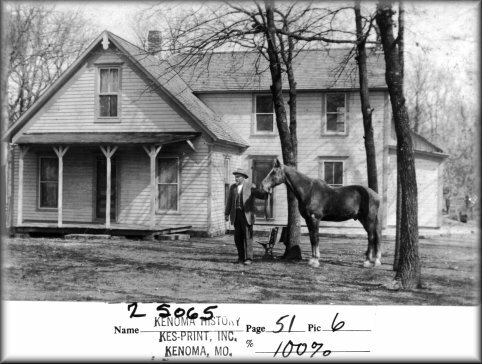 He lived his last days as a gentleman farmer in Golden City, Missouri. AD was remembered driving a surrey pulled by a horse as he observed his lands and farm. The surrey had a top with cloth balls hanging around the edge.